today we are also very happy beacuse we add some new game in our lesson and kids enjoyed the new segment too much. they also enjoyed the dancing and singing time too. we are also so happy to see them happy. it's another saturday. the students like saturday's special segment the most. it's called '' learn with fun''. first, all the students gathered in a circle, after that we started our game. because of the rain we did not go to the park. but we enjoyed playing at the school. how are you all? its sunny outside so the kids wanted to go to the park. after reaching there we had a lot of fun. in the school we started teaching some new topics. 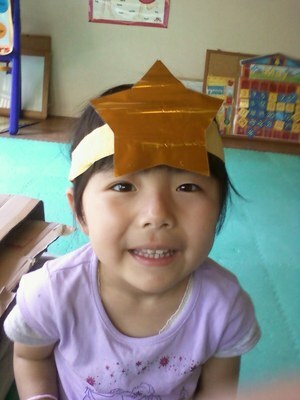 the kids were adopted to the new ideas very warmly. we are so hopeful about them. Well the little typhoon blew over, and now today is nice and sunny, perfect weather for me and the kids to do a little gardening. We chopped alot of branches and filled many bags with leaves, the kids were very helpfull..
Hello everyone, We hope you all had a great golden week. now we are back at school it looks like a typoon is heading our way. So we stayed indoors today and did our lessons and played with the train set.